Ever since his debut at the old Fraser Gallery in Georgetown, for years we have been following Tim Tate’s work, its extremely distinctive and unique look: Victorian bell jars hiding mysterious videos…each one very thoughtful and complex and full of clues, meanings and arcane paths. Then suddenly this year, Tate’s work veered. Perhaps the DMV's best-known artist claimed to be working on "secret projects"... And he would not talk about them. Well, maybe he does have a "soft side", but I've never hidden the fact that I love and admire those deeply thoughtful and complex pieces that he has become so well-known for; that was my favorite Tate and several of those pieces hang in my home. Well….this week Tate will unveil what he has been working on under wraps for the last six months…..and it was worth the wait! Expanding on his video fascination and leaving the domes behind, Tate offers an innovative and revolutionary new format to showcase his video work. The first of these new pieces, the first of many to come, will be shown at the upcoming Artomatic show to give it a test run. Here is what's coming: Tate takes a 42” flat screen TV, and then frames it with an ornate Empire frame….and then, as if that wasn't enough, he paints the frame with a Charles Rennie Mackintosh satin black. This gives the TV a slightly Gothic / Steampunk look, while at the same time also making it look as fresh and contemporary as any shown at ArtBasel. Tate’s video work has also been refined completely. Now working in high definition (HD), and in color, his richly textured and multi-layered video has morphed more into the vein of a surrealist dialogue of contemporary realism than his older work; but abstract enough to be compelling and mysterious. The title of the first seminal piece is “Reforged Each Morning, My Fate My Own.” It is a collaborative work with Tate’s long time photographer (and a very gifted one at that) and friend Pete Duvall. This initial piece highlights the skills of both artist and technician. As it unfolds, seduces and hypnotizes the viewer, you can’t take your eyes off of it. Why? It references early Maxfield Parrish in a way….with the deep rolling clouds that deliver the ever shifting texture. Add inverted glass objects coming into the frame; smashing and reconfiguring over and over: You cant take your eyes off of it! 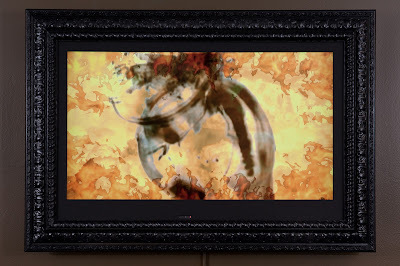 This video has all the look of a spectacular painting, but instead of a three-dimensional object, Tate takes the viewer into the 4th dimension... sliding the view through the painting over the next minute or so. Think of it as a painting that is 24" x 48" x 60 seconds. Let me repeat: Height by Length by Time: Welcome to the 21st century of art. This piece, and those that will surely follow, show Tate entering his mature artist phase. For those of us less than subjective fans who have followed his career for this last decade, it couldn’t be more fresh and exciting. Because it was Artomatic a decade ago who gave Tate his artistic wings, Tate is using Artomatic as a test audience for his newer style, complete with a comment book on the pedestal in front. A "test run" before releasing the new works in the broader contemporary art world. Let him know how you feel about it…..I think that this may be his best and most sophisticated work yet. Artomatic opens on Friday, May 18 at 6PM with a massive art party. The ninth annual Bethesda Fine Arts Festival, a two-day event highlighting 140 contemporary artists who will sell their original fine art and fine craft, is this weekend. The festival is scheduled for Saturday, May 12 from 10 a.m. – 6 p.m. and Sunday, May 13, from 10 a.m. – 5 p.m. It is free to the public. Artists from throughout the country representing 25 states and Canada will showcase painting, drawing, photography, furniture, jewelry, mixed media, wood and ceramics. The bible of outdoor arts festivals, Sunshine Artist Magazine, ranked the Bethesda Fine Arts Festival as one of the top 100 Arts Festivals in the U.S. and Best Show in Maryland and Washington, D.C. The festival will be held in downtown Bethesda’s Woodmont Triangle along Norfolk, Auburn, Del Ray and Cordell Avenues, and will feature live entertainment, children’s activities and Bethesda restaurants including Haagen Dazs, BlackFinn American Saloon, Mamma Lucia, Hard Times Cafe and Yamas Mediterranean Grill. Admission to the Bethesda Fine Arts Festival is free. The festival is located six blocks from the Bethesda Metro station and free parking is available close to the event in the parking garage located on Auburn Avenue.